The 10 tribes of Garou once raged across the Dark Medieval, secure that none could challenge their power. They defended their sacred places without fear of man, Cainite or beast. But now that the first prophecy has come to pass, the werewolves know fear. Will the other visions come to pass as well? Can the Garou prevent them? Even if they can, how much blood must be spilled to do so? 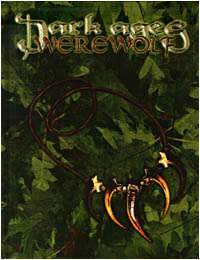 Dark Ages: Werewolf is a complete, hardcover resource for playing the werewolves of the Dark Medieval world, in the tradition of Dark Ages: Vampire and Dark Ages: Mage. It contains comprehensive information on werewolf society, special rites, Gifts from the spirits and descriptions of their dire enemies, as well as a look at the Dark Medieval from the perspective of these savage shapeshifters. Does it haven't spanish version? will be a print on demand service for this book someday?